Hybrid fish are often brought up in conversation when it comes to species identification. In order for two fish species to hybridise, they need to be very closely related in the gene pool, even then there's not always a guaranteed cross. Hybrids are not encouraged as they can dilute species and often the offspring are ugly. 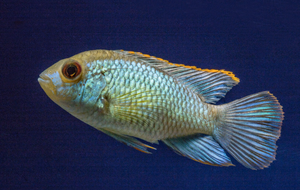 Many aquarium societies will not except any Hybrid fish to be sold during club meetings or auctions, this is to prevent "contamination" of the genetics of the species. One other reason that hybrids are discouraged is that most species will not hybridize in nature, Hybrids may also have problems such as fin shape not found in parent fish. Some fish will only hybridize with other closely related fish under certain lighting conditions. Hybrids are usually associated with great controversy especially when the species is now extinct in the wild. An interesting observation, especially with Catfish hybrids, is the growth of these fish is twice as fast as their purebred relatives, this must be taken into account if you are considering keeping a hybrid! They may also grow larger than either of their purebred parents. Below we have compiled a list of true hybrid fish and how they came about. Guppy x Endler - They will have the elongated fins of the Guppy, but the orange/black distinctive spots of the Endler, they will also be smaller than a Guppy. They can vary in pattern greatly, and many hybrids are now been selectively bred to create specific strains, such as the Tiger Endler. 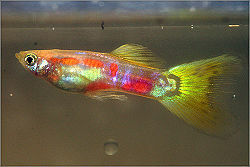 Many Endlers bought in pet stores are often Guppy crosses, true Endlers have rounded short fins, the crosses will have more angular longer fins. Female Guppy/Endler hybrids will be harder to spot due to the lack of colour compared to males, it's best to rely on the tail shapes to identify them. Platy x Swordtail - Closely related, won't create fish that look much more different than a Platy. Platy x Platy - There are several Platy species, store-bought Platys are usually hybrids already. Molly x Molly - (or Poecilia sphenops), as above with Platys. Molly x Guppy - Called a "Muppy" or "Golly". This does happen, but the fry are sometimes very weak and do not live long. Even if they are stronger they are usually nondescript in coloration and fins and people rarely persist with them. 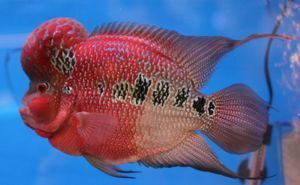 Not all Cichlids can hybridise either, and crosses are often unsightly and undesirable, the exception being the Blood Parrot Cichlid and the Flowerhorn. It is NOT encouraged to breed these hybrids and put them into the pet trade, it only dilutes bloodlines. It must be noted that many of these crosses are highly aggressive fish and are best kept in species tanks or with equally mean-tempered robust tank mates. The only real exception is the Blood Parrot, but it can still pack an attitude if it wants to! Flowerhorn - The exact crosses that create this fish are unknown, but it's suspected to be a cross of Cichlasoma trimaculatum, Amphilophus citrinellus with possibly Cichlasoma festae and Vieja synspila also added to the mix. Flowerhorns are quite desirable, especially in the Far East, and large males with large nuchal humps can be exceptionally pricey. 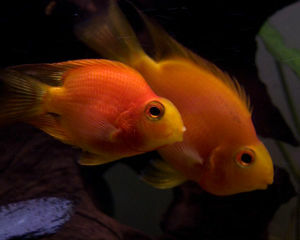 Blood Parrot Cichlid - exact crosses unknown, often are not fertile, but fertile BP's are becoming more common. Electric Blue Acara - Electric Blue Ram x Blue Acara - The Electric Blue Ram gets about 3 inches and the Blue Acara gets about 7-8 inches, this hybrid will get about 4-6 inches depending on whether the fish is male or female. The Electric Blue Acara inherits a beautiful shade of blue from its Ram mother and the streamlined body and beaked face of its Blue Acara father. 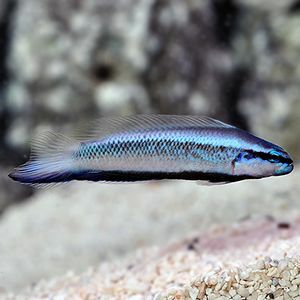 You need to be really careful when buying African Cichlids, specifically Mbunas, from pet stores as many on the market are hybrids, if you want genuine purebreds it's best to go to fellow breeders or at least enquire further about their history. Never buy African Cichlids from a tank labelled "mixed Cichlids", you don't know what you're going to end up with. Red Tailed Catfish x Tiger Shovelnose Catfish - will grow larger than both parents so expect a fish around 4 ft long! Not for beginners or those without large indoor tropical ponds over 3785 Litres (1000 US G.). Red Tailed Catfish x Perruno Catfish - another potential monster. For tropical ponds only. Red Tailed Catfish x Marble Catfish - again, see above! 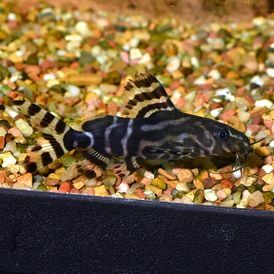 Synodontis Angelicus x Synodontis Eupterus - has spotted and striped wavy patterns adopted from both of its parent species. Finding hybrids in the marine fish trade is far more uncommon than freshwater, mainly as only a tiny proportion of marine fish in the trade are captive bred. As the hobby progresses, however, some may appear. The following have been seen on sale. This page was last edited on 16 April 2019, at 19:16.